Robust, flavorful cuts of meat love a wood fire. The smoke coats the meat with a layer of flavor sealing in the meat’s juiciness. 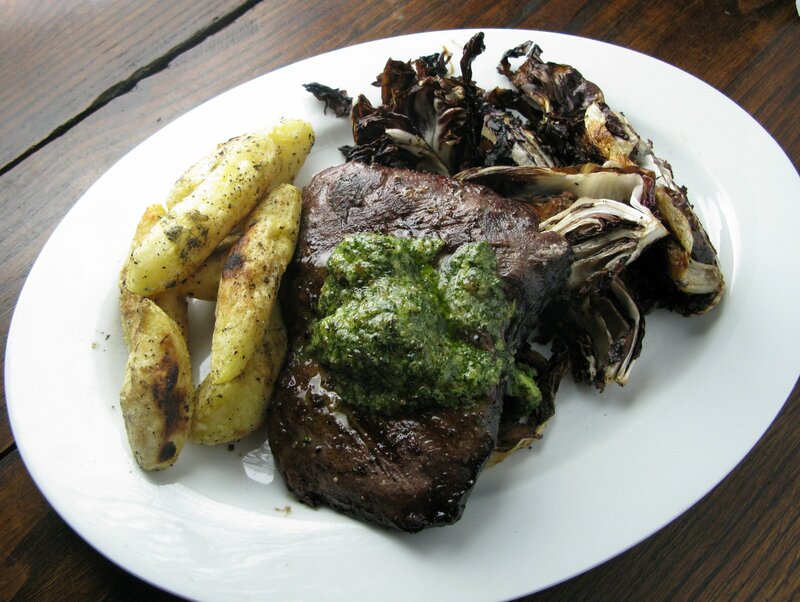 Wood grilled hanger steak is a family favorite. The lean meat comes from an interior muscle that sees little action. The cut, called onglet in French, is tender and flavorful, a bistro favorite. We slather it with a pungent green anchovy butter made with kale and scallions. Hanger steak consists of two lobes connected by a tough vein, which some butchers remove for their customers. We purchased a whole untrimmed hanger steak. (What is pictured on the platter is half of the beef, which amply served three of us.) Should hanger steak be unavailable, flank or skirt steak are good alternatives. Regardless of the cut used, cook the beef no more than medium rare. Then slice the meat against the grain to ensure tenderness. In winter, we cook the steak in our fireplace on a Tuscan grill. But the dish can be easily prepared on a gas grill or in a skillet on the stovetop. (Roast the vegetables instead.) Read all about cooking with wood in your home fireplace here. You’ll have more green anchovy butter than you need for one meal. Freeze what’s leftover to use on any kind of grilled meat or roasted squash, parsnips and turnips. To make the green anchovy butter, cut the butter into several pieces. Set aside. Blanch the kale leaves in salted boiling water for two minutes. Remove from the water, shake off any water that sticks to the leaves. Let them drain and cool. Then chop the kale coarsely. 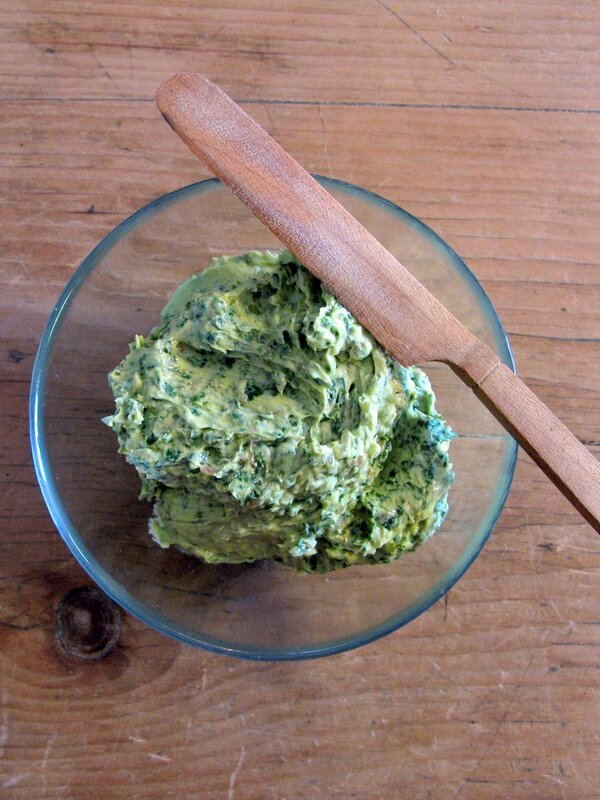 Place the kale into the bowl of a food processor fitted with the metal blade. Process for thirty seconds or so until the kale is finely chopped. Heat the olive oil in a small sauté pan. Add the shallots and garlic. Cook over medium heat until the shallots begin to soften, for about two minutes. Add the hot sauce. Scrape the shallot mixture into the food processor. Add the lemon juice and rind, the anchovies, pepper and salt. Pulse a few times until the ingredients are well combined and the anchovies are no longer visible. Add the butter. Process until the mixture is smooth and no pieces of butter are visible. Scrape the bowl and process some more until the bright green butter is smooth. Scrape the butter into a container. Refrigerate until ready to use. Salt and pepper the hanger steak. 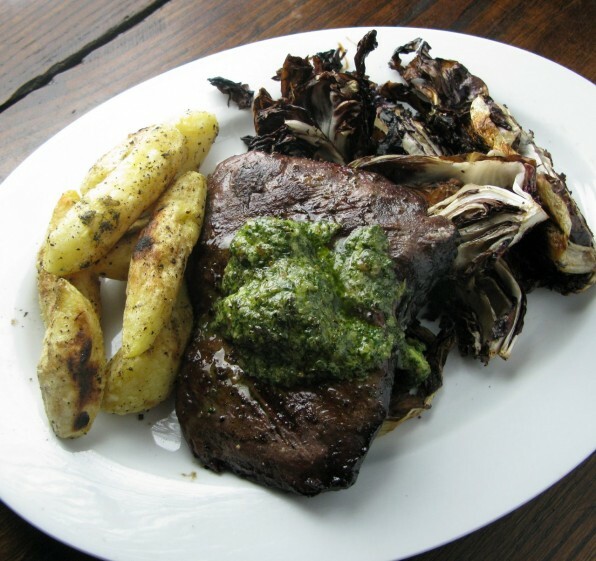 Place the radicchio wedges and blanched fingerling potatoes on a baking sheet. Drizzle them with olive oil. Season with salt and pepper. Refrigerate until your grill is ready. 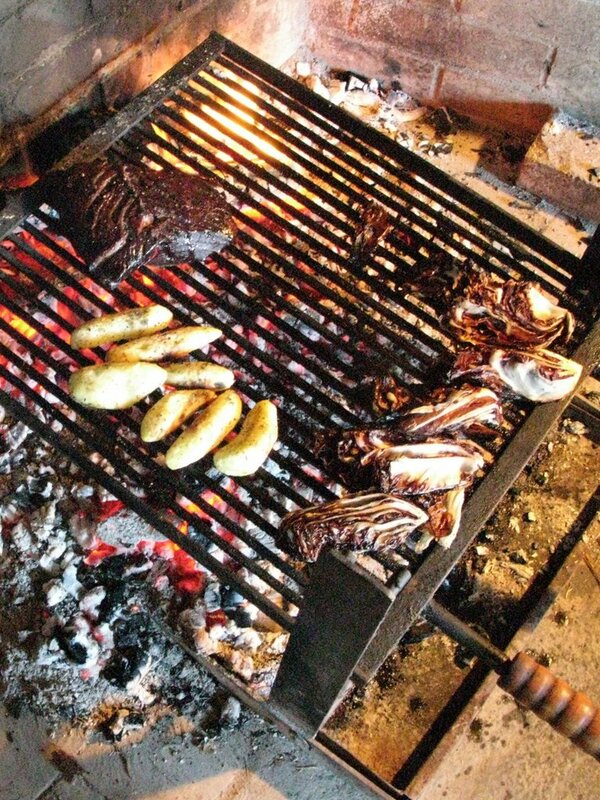 To cook the steak and vegetables, prepare a wood fire for grilling. Let the flames burn down. Rake the embers into an even level. The fire is ready when the flames have died down and all that remains are glowing embers. Put the Tuscan grill over the embers for at least 15 minutes before grilling. Hold your hand about 8 inches above the embers. You should only be able to hold your hands above them for 2 or 3 seconds before it gets too hot. (Or maybe less. We have chef hands.) Or heat a gas grill to a medium high heat, around 375°F. Place the radicchio and fingerlings on a hot section of the grill. Cook them on one side until lightly browned, for about 5 or 6 minutes. Using long tongs turn the vegetables over and continue cooking until they are lightly browned and cooked through. Move the vegetables to a cooler section of the grill. Place the hanger steak onto the hottest section of the grill. Cook until the meat is seared on one side, for anywhere from 5 to 9 minutes depending on the heat of your fire. Spray water on any flames that shoot up and scorch the steak. Flip the meat and continue cooking until the meat is medium rare, for about 5 to 7 more minutes depending on the heat of your fire. An instant read thermometer inserted into the thickest section of the meat should register 130°F to 135°F. Remove the meat to a platter along with the vegetables. Spoon some of the green anchovy on top of the meat. Let it rest covered loosely with foil, for 5 minutes before slicing and serving. Slice the meat on the diagonal into ½-inch thick slices. Serve with the vegetables and more anchovy butter as needed.